Hey Internet how’s it going? Are you fine folks enjoying the Holiday Season? We here at Comic Impact are! We have had so many things to be thankful for this season but mostly it is that we are thankful for you! You are the ones that push us every week to record a new Pick of The Week and a New This Week! You are the ones that remind us to do Did You Catch All That? at the end of every month. Thank you Comic Impact readers for supporting us by reading and commenting. If it were not for your interest in all things comic related we would not exist. Sheldon and Simon have always tried to be a watch dog of sorts for the comic industry.Our goal has and will always be to give our readers a slice of everything going on in the comic world. Whether you read comics every week or you are a first timer, we will continue to show you all that the comic industry has to offer. Thank YOU again Comic Impact readers from Simon,Sheldon,Matt, Pat, Antonio, Travis, Adam, Gabo, Roxanna, Brian & Rob. We hope you have a very Merry Christmas and a safe and Happy New Year! 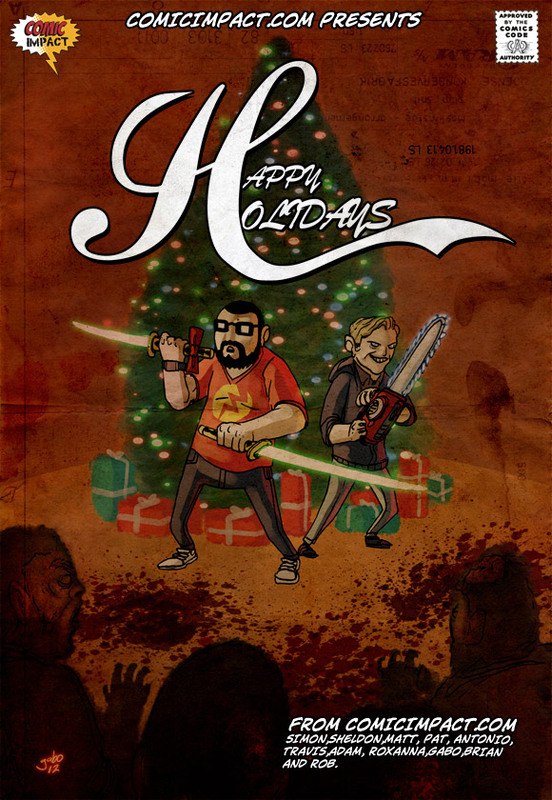 Also we would like to give a special thanks to Gabo for this special Holiday card.